Density testing is made simple with the TA Instruments fully Automated Density Tester. 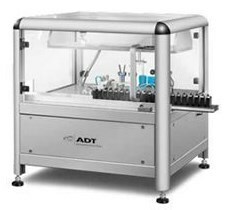 This fully programmable, automated system measures the density of cured rubber materials using the finite difference (buoyancy) method. Active measurement of the fluid temperature increases accuracy by accounting for small changes in the density of the immersion fluid with temperature. There are no threads in TA Instruments ADT Reviews at this time.